Jim Garb - BIO - 2007-07-28 - Creighton University - M.D. Michael Henry - 2016-10-14 - Harvard University, KU, UMKC - Ed.M., M.S., M.A. My Dad pastored Memorial Baptist Church. My brothers and I attended Parkade Elementary, Jefferson Jr. High, and Hickman HS. My folks moved us to Casa Grande, AZ after my junior year, the summer of '66 and I graduated HS from Casa Grande Union HS in '67. Attended U.of AZ, Grand Canyon University, and Central Arizona College. Worked several jobs before joining the Arizona Department of Public Safety as a Trooper in '74. Married my second wife, Diane, in '84, and we have four children between us, as well as two grandkids and another on the way. Diane and I retired as State Troopers in May of '02. We served in duty stations in Casa Grande, Houck (NM/AZ border on I-40), and Gray Mtn. (US 89 about 40 miles north of Flagstaff). 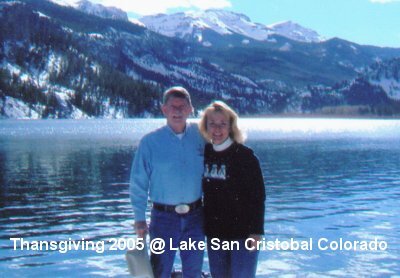 We moved to Lake City, CO right after retiring. We had purchased a home here in '99 and now live here full time. Lake City is in the SW part of Colorado, about 55 miles SW of Gunnison and sits at an official elevation of 8671'. We are surrounded by five 14K peaks. The county is 96% Federal land, with about 47% of that wilderness. The hunting and fishing here is outstanding! Diane just purchased the real estate business she had been employed at, Wilson Realty-United Country Real Estate. I have filed the paperwork to run for Sheriff in this year's campaign, here in Hinsdale County. The entire county only has about 800 registered voters and I know about 700 of them. My Mom, Doris Bruce, lives in Sun City, AZ. My Dad, Byron Bruce, died of a brain tumor in '71. My middle brother, David (would have been Class of '69), is an attorney and senior partner w/a large firm in Virginia, heading up their offices in Washington, DC and Harrisburg, PA. He's married w/three kids, all grown and out of college themselves now. My little brother, Mark (would have been Class of '71), lives in a Milwaukee, WI suburb. He's a trauma surgeon and his corporation staffs the ERs in four area hospitals. His wife is also a medical doctor and they have five kids, with only one left at home. 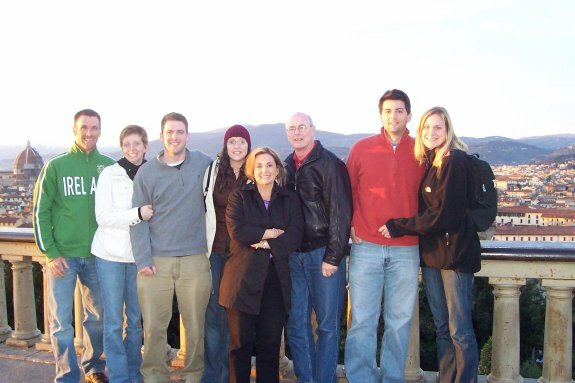 We stay in contact with Rich ('67) and Mary Withrow; Jack ('67) and Val ('68) Reed; and Steve ('69) and Lynda ('69) Baumgartner. It was great fun attending Hickman and I sure hated the move. We hope to make the 40th reunion in '07 if it comes off. If any of you are out our way, do give us a hollar. Jeannie and I have 3 wonderful boys and a beautiful daughter-in-law. John and Shannon will make us grandparents at the end of March 2003. I graduated from Mizzou in Dec. 1971 and went right into graduate school, finishing in August 1975. I played in 3 groups in college and afterwards - Ron Grubbs Soul Review, Aesop & the Fables and the Comic Book Society, and am a member of Delta Tau Delta fraternity. I have worked for State Farm for 25 years and have continued to perform musically everywhere we have lived. I was a member of the Rose Valley Chorus in PA., the Ardensingers in Delaware, the Charlottesville Light Opera Company, sang leading roles in 1 act operas, did musical theater in Ore., played sax in the Heartland Jazz Orchestra, oboe in the Heartland Philharmonic and lead roles in the Bro-Menn Follies. Currently playing sax in the State Farm Big Band and have been a college lacrosse referee for 15 years. 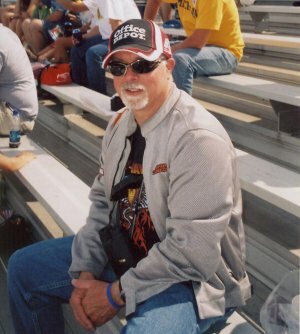 I enjoy woodworking and motorcycles, and was chairman of the Charlottesville Vocational Advisory Council for 7 years. I moved back to Columbia 1995. After my divorce I packed my two kids up and moved home. My daughter is a new MU graduate, and my son is a Freshman at Moberly Area Community College. I am still working for the Missouri Department of Corrections, at the Fulton Reception and Diagnostic Center. Well, thats the main thing about me. Now the little things, I enjoy doing crafts, reading, watching movies,and of coutse I have my favorite T.V. shows. I enjoys walking the Katy Trail, going to the Boat and watching my money go down the drain, but its fun. I have done a little traveling since high school, Colorado, New York City, Clearwater Florida, San Francisco, Las Vegas, Lake Tahoe, Oklahoma City, Chicago, Tucson, Indianapolis for the 500, of course, lots of places in Missouri. There are alot of other places I would like to see in the good ole USA, maybe someday, now that I am an empty nester, maybe I can get there. Thats about it I guess. See you at the Reunions. After all these years, I am still in the motorcycle business. If you live in Columbia or are visiting, come to Jones Power Sports & visit me. I have been married to my wonderful wife for 12 years. We have 2 daughters (his & hers). No grandkids yet(thank goodness, sorry grandparents). My wife is getting her degree in marketing management, so she can retire me. If you want to know more & you have a large capacity hard drive, email me & I'll tell you the whole story. After graduating from Hickman, I joined the Air Force and spent a year in Vietnam. I spent a total of 22 years in the Air Force before retiring. I worked for the Federal Government after completing my bachelors degree and retired from there. I am currently a Tax Specialist with Embarq Communications in Overland Park, KS. Attended Rose Hulman and University of Missouri, graduating with a B.S. in Chem Eng. in 1971. Went to work for Exxon Chemical in Baton Rouge immediately after graduation, and in July 1971 wed high school sweeheart Marilyn Walton (HHS '68 grad). Worked for ExxonModil 35 years, working mainly in polymers technology, at various times in Baton Rouge, Linden NJ, and Houston TX. First son Matthew born in 1978 in Baton Rouge, and second son Andrew in 1981, also in Baton Rouge. Involved in Presbyterian church throughout life, and in Boy Scouts, volunteer work, and sports like golf, running, biking, diving, and backpacking. Also involved in hobbies like amateur astronomy and wine making. Travelled extensively in Europe and Asia for business. Retired 2006 after 35 years. I was born in Charleston, W.Va. July 19, 1949. I moved to NYC after my dad died as a result of an auto accident. My mom remarried when I was 5, and when I was 16 I added my stepdad's last name, Garb. My dad was a physician at the University and taught medical students clinical pharmacology. He was also very active in the civil defense movement in the 1960's. I moved to Columbia in 1961. I have 2 brothers, Gordon and Richard. I attended Jeff Jr. from 1961-63, and Hickman from 1964-67. While at Hickman I was the basketball manager for coach Jim McCleod. After high school I attended the University of Missouri and got a BA in zoology. I then attended Creighton University School of Medicine in Omaha, NE. I graduated from Creighton in 1975 and did a pediatric residency in Phoenix, AZ. In 1978 I moved back to Columbia and started practice with the Boone Clinic Pediatric Group. I left there in 1985 and have been in solo practice since then. My current office is at 1505 Chapel Hill Rd. Suite 203. My wife is Candy, she is the director of student services for the Department of Health Management and Informatics at the University. We have been married for 35 years and we have 3 children Adam 30, Amy 28, and Eddie 25. I have 2 grandchildren that are Amy's, Morgan 2 and Jensen 3mos. They live in Fenton. I enjoy following the Kewpies, especially football,(Adam played in 1993 and 94), and also the Missouri Tigers. I also love to ride my Harley when I get a chance too. I really like living in Columbia and seeing so many people that I have known over the years and especially when I get to take care of their children and now grandchildren. I graduated from Highman in 1967. Married Floyd W Wilson in Dec. 1967. Had 2 beautiful boys. Toby (Floyd W Wilson III) in Feb 1969 & John in Jan 1973. Floyd & I were married for 24 years when he suffered mid-life crisis. We divorced Dec. 1991 & have remained friends since. Toby graduated from Hickman in 1987 for which I am very proud. John also attended Hickman but did not finish but married a wonderful girl & gave me a beautiful grandson in 1989. I am currently married to Roger & have been since 1998. I have learned much about marriage & divorce & being my own person. We live in Sparta MO, 25 miles North of Branson. Springfield is 10 miles North of Sparta. This is the hometown of Roger. I would love to hear from some of my classmates that I was friendly with. There won't be many since I tended to be a loner in school from being excessivly shy. That is no longer the case. As a matter of fact the complete opposite is true. I am very glad for this opportunity to become part of the Kewpies again. B/4 I forget, in school I was knows as Mary (my family called me Susie) & today I go by Susie. I am very uncomfortable with Mary. Thanks. I have just retired from the Missouri Department of Corrections. I am a Licensed Professional Counselor and have my Master's from the University of MO. Columbia. I have four children and six grandchildren. I am very active in my church, Woodcrest and love to travel. I HAVE BEEN MARRIED TO MY HUSBAND GARY FOR 31 YEARS. WE HAVE TWO WONDERFUL DAUGHTERS. SARA IS 29, IS MARRIED AND HAS TWO BEAUTIFUL DAUGHTERS. LINDSAY WHO IS ALMOST 2 AND KATE WHO WAS BORN DECEMBER 17TH. OUR DAUGHTER KIMBERLY IS 26,IS MARRIED AND IS HAVING HER FIRST BABY IN EARLY SEPTEMBER. WE FEEL VERY FORTUNATE TO HAVE BOTH OF OUR GIRLS LIVING NEAR US AND WE ADORE BEING GRANDPARENTS. WHAT FUN! WE LOVE TO TRAVEL,SAIL, AND SPEND TIME WITH FAMILY AND FRIENDS. GARY AND I ALSO FEEL BLESSED TO STILL HAVE ALL FOUR OF OUR PARENTS. GARY IS STILL PRACTICING MEDICINE AND PLANS TO RETIRE IN A COUPLE OF YEARS. WE GET DOWN TO COLUMBIA SEVERAL TIMES A YEAR TO VISIT WITH FAMILY. IT IS HARD TO BELIEVE HOW COLUMBIA HAS GROWN! After graduation in 1967, I worked at Mattingly's where I worked before graduation. In 1972 I re-met a man that I had known even before I was in preschool that had come home from a tour in the Military. We got married 3 months later and have been happily married for 35 years now. We have 2 beautiful children, blessed that we had a girl a boy. They are both grown and have their own families now, giving us 5 grandchildren in all. 10 months after we married my husband re-entered the United States Air Force with choices of the Navy or Air Force. We chose Air Force. Together we have lived in 17 different states and countries. Some of the best and most memorable have been California, Colorado, North Dakota, Alaska and Sicily, some that we didn't really like too well was North Carolina, but that's a whole another story. I have managed Taco Bell which keeps me massively busy for 15 years now, some days better than others. 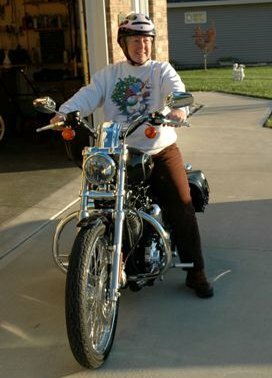 For fun my husband and I have separate Harley-Davidson Motorcycles. Can you imagine I gave up horses for motorcycles, any ways I love them. We love traveling, going places like Colorado to see the awesome mountains and Minnesota to see the lakes and light houses and so much more. I am very active in our church being the church secretary for 3 years and serving our Lord in many ways. With the motorcycles we joined Christian Motorcyclist Association(www.cmausa.org) Cornerstone Chapter. I now serve as the secretary for this and a huge mission we accomplish is prison ministry. I would love to hear from any of my classmates to see how they are and what they have been doing.